We got our Google Fiber hooked up this week! My internet is Speeeeeeeedy McSpeederson! AND my family sent me some fresh honey from the farm!!!!! YUM! AND my husband started back as a teacher! High five hard working teachers! AND my middle sister went off to college! High five college students! AND the Royals are dominating… wild card spot here we come! AND one of my best friends is having her baby!!!!! Right. Now. You get the picture. The arrival of this beautiful baby girl is more exciting than the onset of my amazing juicy heirloom tomatoes. Ya…Mirabel, you are that special and your KC family can NOT wait to meet you. *check phone* Still no word. 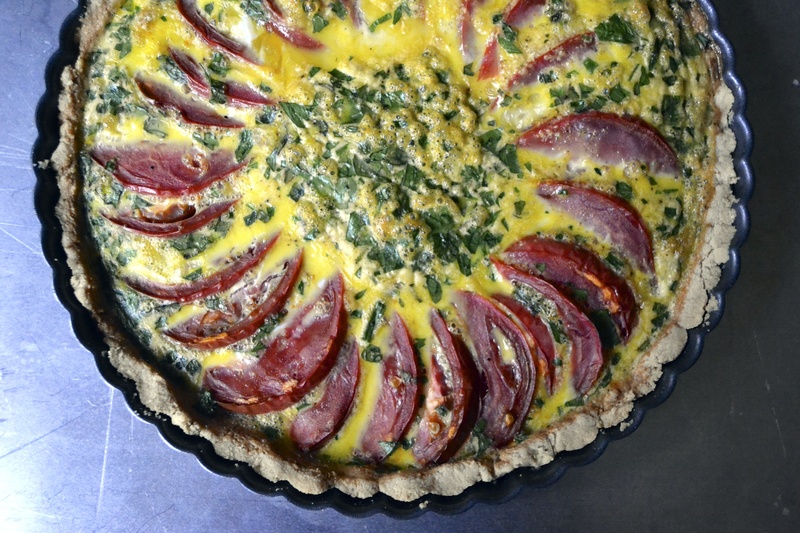 Ok, so, since Mira still hasn’t come, let’s talk about this heirloom tomato Quiche. I used my basic almond flour tart crust and filled it with a thinly sliced Cherokee purple tomato, fresh herbs, and fresh farm eggs. I have made this for the past several weekends. 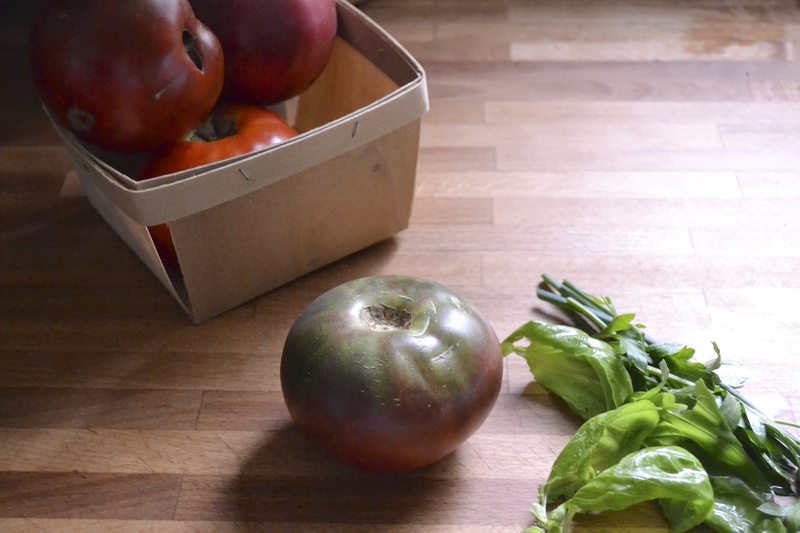 The rosemary crust and fresh heirloom tomatoes are splendid together. This is definitely a winning brunch recipe that is perfect whip up when you have company. And don’t think quiche is just for breakfast, I ate this puppy for lunch and dinner! Preheat oven to 350 F. Prebake rosemary almond flour tart shell (or crust of your choice) for 10-15 minutes. Remove from oven and allow the tart crust to cool on a wire rack while you prepare the filling. Slice one large heirloom tomato in half. Then slice in very thin slices, perpendicular to the first cut so that you have thin half moons (as shown in the pictures above). Place a few layers of paper towels onto a large plate. 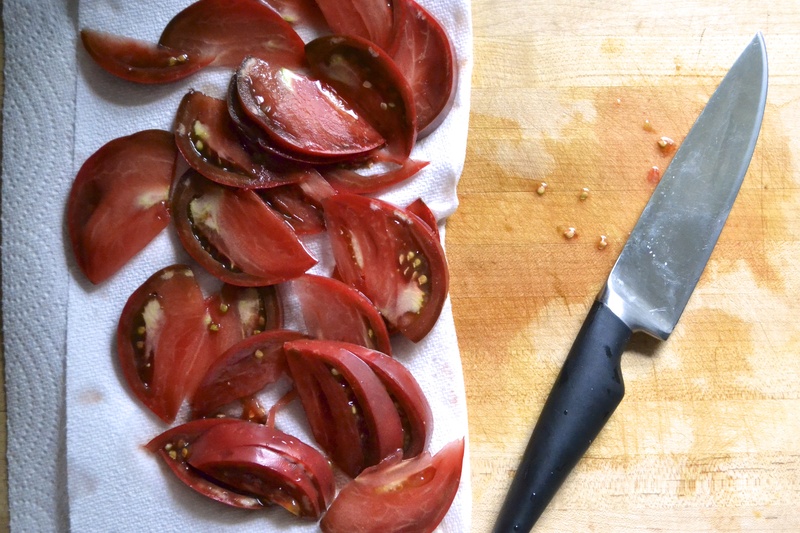 Lay out the tomato slices in a single layer on top of the paper towels to drain some of the extra juice. Sprinkle lightly with salt. Allow to sit for about 5 minutes. In a medium bowl, combine the eggs, herbs, salt, dijon mustard, and pepper. 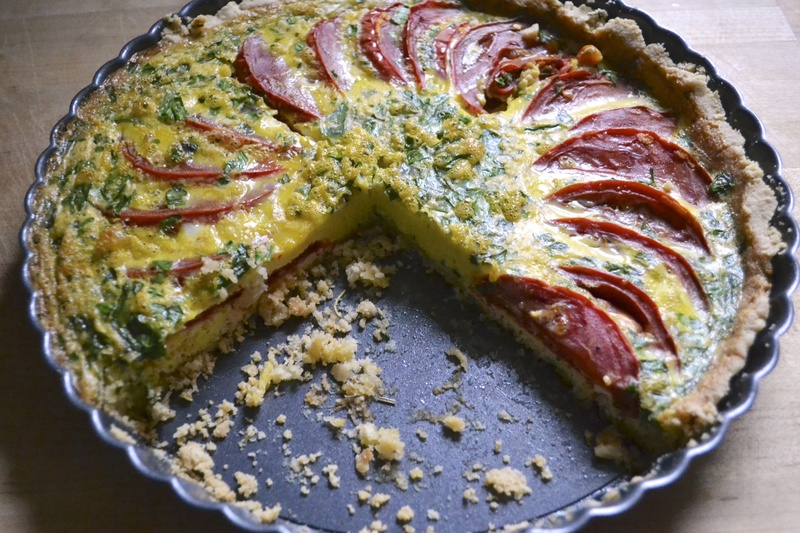 Place the tart crust on a rimmed baking sheet (to catch any flow over of the quiche filling). 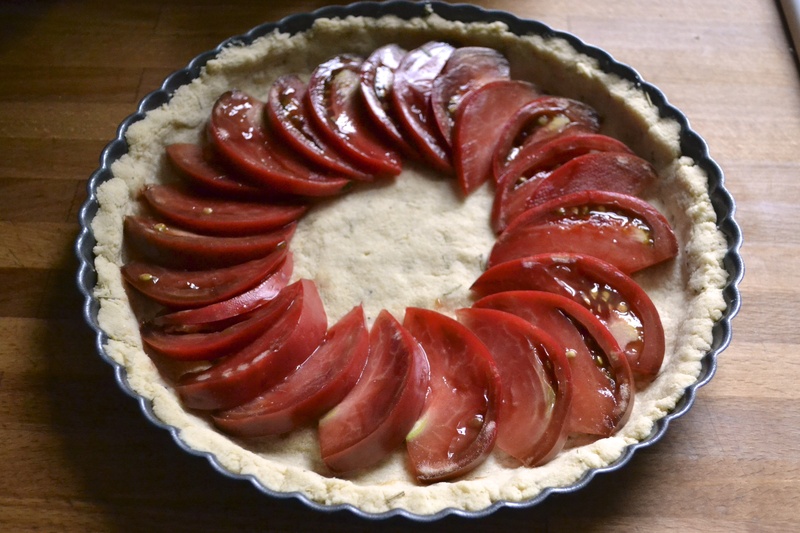 In the slightly cooled tart crust, place the tomatoes in a single layer in a circular fan patter on the bottom of the tart crust. 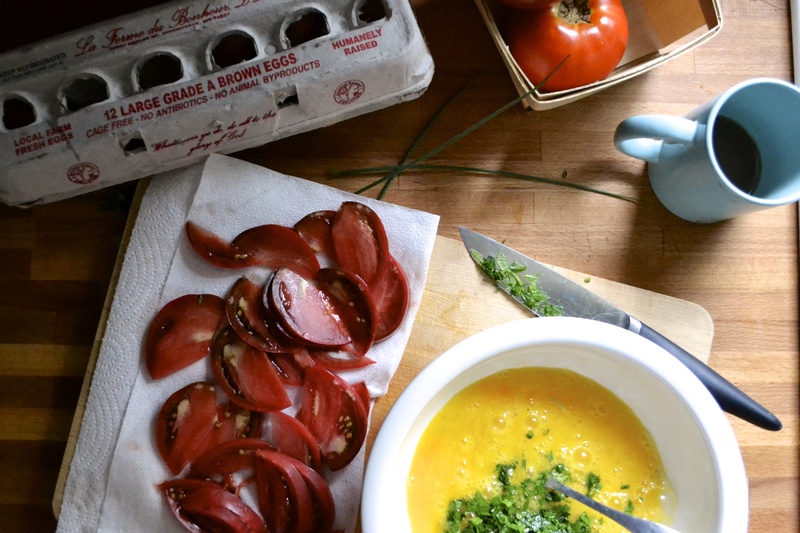 Pour the egg mixture evenly over the tomatoes. Using the rimmed baking sheet with the filled quiche into the preheated oven. Bake for 45-55 minutes, keeping an eye on it. It will be done with the center of the quiche is set. Transfer to a wire rack and cool for 10 to 20 minutes. Serve warm. I dont know if I’ve ever seen an egg dish look SO pretty! And now I want quiche! Thanks! She’s a show stopper!